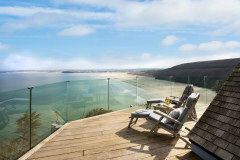 Follow the winding coast road past the stunning scenery of North Cornwall and arrive at Glas Mor, perched above Mawgan Porth beach. This wonderful home has been flawlessly transformed with luxury in mind for a very special holiday beside-the-sea. Glas Mor offers 4 bedrooms, 4 bathrooms and a relaxed open plan layout of social spaces making this home perfect for larger families or gatherings with friends, whatever the season. 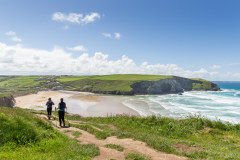 With a plum position in Mawgan Porth, skip to the golden sands and rolling surf in minutes, breathe new life into your walking boots as you head along the South West Coast Path or jump in the car and explore the natural energy of the area including Watergate Bay, Padstow and Rock, Harlyn Bay, Newquay and much much more. 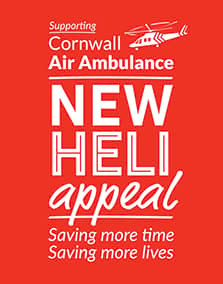 ******** Please note there is currently development work taking place at the neighbouring property, please contact the office for further information. Glas Mor has recently been re-styled by local interior designers who have creatively combined the natural hues of the Cornish coast with a pared back Scandinavian twist. The modern kitchen is kitted out with all you could need to create a mouth-watering menu using the finest of ingredients such as fresh fish straight off the boat in Padstow and local meats from Trevilley Farm shop, not to mention the finest fizz from Trevibben Mill! Dine in style at the dining table as you map out the holiday itinerary and catch up on days adventures. 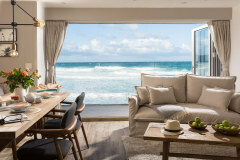 The living space welcomes lazy afternoons beside the fire in the cooler months or escape for a quiet solo afternoon whilst the others hit the beach. The luxury bedrooms are set over the ground and first floors of the house, each room has been thoughtfully dressed in the finest linens and furnished with the very best beds for a good night's sleep. Step out from the kitchen into the generous outside space that wraps around the whole house, the gated entrance ensures a safe haven for children and dogs to explore and play. The outside dining table welcomes al fresco dining from sunny breakfasts to hearty suppers. 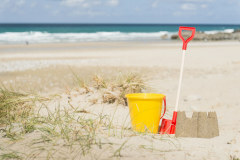 With Mawgan Porth beach just a short walk away, your outside space is extended to the golden sands and oh so blue seas so days are spent flipping from your holiday door to sandy shore! The local community at Mawgan Porth offers a warm welcome and one-stop for all of your daily essentials from fresh coffee and bread at Cornish Fresh, the daily papers at Betty's Newsagents and, of course, those holiday ice creams and fish and chips! The Merrymoor Pub welcomes families for pub-grub and a local pint or head to the delicious home-cooked fare from Scott and Babs. 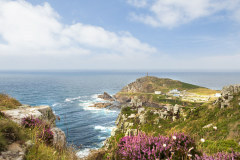 Cornwall is firmly on the foodie map and nowhere more so than the stretch of coastline from Newquay to Padstow. 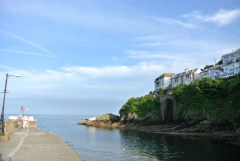 The natural beauty and footprint of the area is an absolute joy to experience as guests learn to master the waves, head out for a days fishing, walk for miles along some of the most stunning coastal paths in the country and discover hidden spots. 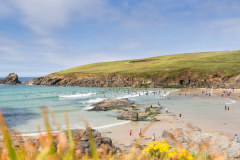 The beaches of North Cornwall are some of the best and include Watergate Bay (approx 20 minute walk from Mawgan Porth), Porthcothnan, Treyarnon Bay, Constantine Bay, Fistral Beach, Crantock... the list goes on. 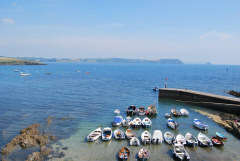 Padstow is well worth a visit or soak up the surf culture at nearby Newquay. Glas Mor offers the perfect backdrop and local base from which to rest, relax and create your own luxury holiday highlife. Access to the garden is via 2 steps down from the back door.